Over the past few weeks, this little blog has experienced quite a bit of traffic. If you’re new here… Welcome! Welcome! So grateful you came along for the ride. It’s been wonderful to see so many new names and faces. Thank you for your words, your emails, your open arms. All wonderful and encouraging and intimidating in equal parts. As you’ve probably noticed, I haven’t been around much this month. I’ve had lots to say (really, when do I NOT have a lot to say…), but — in all honesty — I’ve been almost afraid to say it. I’ve been worried that these words won’t resonate. I’ve been thinking about those words resonating so loudly — the ones that brought you all here — and it feels like a failure of sorts if what I continue to write doesn’t move you in quite the same way. But this blog began as a chronicle of our lives — the extraordinary in the ordinary — and that’s where its roots will continue to grow, for better or for worse. In the emails I receive, kind strangers thank me for being honest and open, for sharing our lives, for making them feel less alone, for saying what has been tucked away inside them for too long. And always, that is enough. So, today, I want to recognize what has most recently been extraordinary in my life. My list might seem a little bit run of the mill, but if you look closely, you’ll see the magic in between the cracks. When we stop and breathe and think and ponder, we recognize that these things are golden. They have staying power. They are what matters. 1. Three kids who are loving their new hometown and their new schools. Loud teenagers in my basement. An eleven-year-old invited to his brand new buddy’s house on a Saturday afternoon. 2. One kid who floundered at first but has found his footing with a little course-correction, hand-holding, electronics-revocation… and (sometimes tough) love. 3. 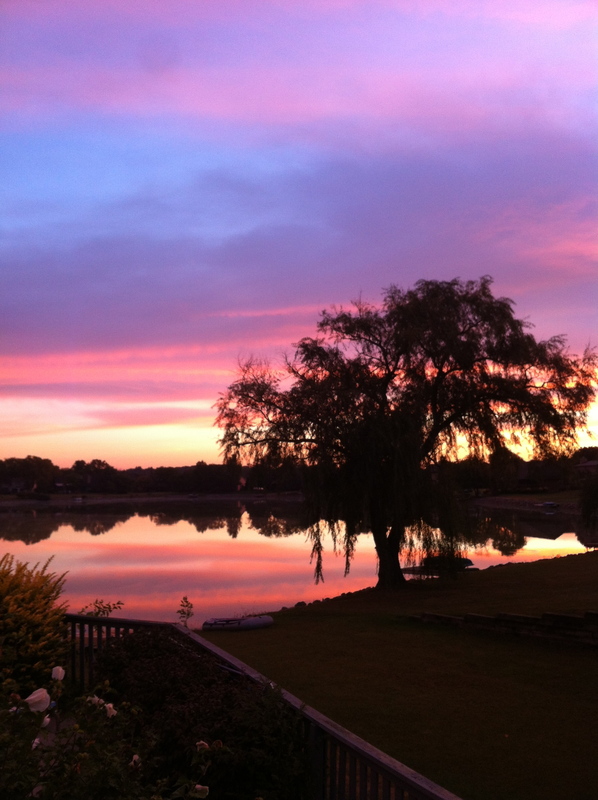 The unexpected gift of experiencing breathtaking sunrises on the lake behind our home. The bonus of watching them with a steamy cup of coffee in hand. 4. Meeting the indomitable Cheryl Strayed. Standing in her brilliance, soaking it in. Getting ready to learn from authors extraordinaire, Connie May Fowler, Amy Bloom, and Richard McCann next week. 5. Successfully hitting all my work deadlines. 6. Pumpkin patches, candy corn, mums, Honey Crisp apples, warm cider, and ginger molasses cookies from Paradise. And big, bulky sweaters to hide the aftermath of all the ginger molasses cookies from Paradise. 7. Letting my kids help me adapt to the new iOS7 (after much resistance and even more whining). 8. Warm, loyal dogs who rest at (and occasionally lick) my feet while I work. 9. Watching the AGT finale with a glass of wine, comfy PJs, a fluffy blanket, and dear friends in the comfort and warmth of one of my favorite homes-away-from-home. 10. Holding my Mom’s soft, wrinkled hand when she awoke from her most recent heart surgery. Listening to the nurses giggle at all her sassy antics. 12. A date night — complete with bourbon flights — with my very best friend (aka, my fabulous husband). Pure, perfect happiness in its many different forms. Find the extraordinary in your ordinary today, friends. It’s there. It always has been. It is within these seemingly mundane moments — before, during, after, and all around them — that a beautiful, rich life is made. This entry was posted in Big Thinks, Man Of My Dreams, My Kids, We Are Family and tagged AGT, Amy Bloom, bourbon flight, Cheryl Strayed, Connie May Fowler, every day life, novelists, Richard McCann, the extraordinary ordinary, What does the fox say?, writing. Bookmark the permalink.